Whether a classroom teacher, substitute, or administrator, EZSubPlans will provide you with inexpensive, kid-tested plans at the touch of a button. EZSubPlans includes seven hours of grade-specific lessons designed to make your next absence easy and worry-free. Classroom teachers wanting to avoid the frustrating and time-consuming process of preparing for an absence and substitute teachers needing back-up material will find everything they need with EZSubPlans. Teachers need only to download, print, and photocopy–the sub does everything else. Just click on the cover to take a closer look in our storefront at TeachersPayTeachers. Grade level designations are flexible, allowing teaching teams to coordinate their usage of EZSubplans. However, they can be effectively interchanged. For example, the 3rd, 4th, and 5th grade plans are all suitable to 4th and 5th. For a free preview, just click on a cover. Click here to view or print a sample Quick Start Guide, which gives you, the classroom teacher, a look at how little you’ll need to do to prepare for a sub. Each EZSubPlans package includes detailed sub-notes, reproducible lessons in such subjects as math, reading, grammar, and art, as well as answers keys and much more. Because we’re teachers, every lesson is tested in real classrooms, and every lesson is geared to meet the standards. Classroom teachers can download and quickly prep a day or multiple days well in advance of an emergency or on the morning of. The sub does everything else. Just click on the cover to go to our storefront at TeachersPayTeachers for a closer look including free previews of every EZSubPlans package. No Need to Panic! Just Click, Print, and Relax! EZSubPlans is designed to make being absent easy and worry-free. No more spending hours preparing material of questionable value. No more writing laborious notes explaining every lesson. With EZSubPlans, it’s all done for you and it’s just $5. Just five bucks! Each package comes with a Quick Start Guide as well as detailed notes the sub can quickly plug into your “Teacher’s Standard Day Chart.” Answer keys are provided for each lesson, too, so when you return everything will be corrected and graded. Just click on the cover to make you’re next sub-day easy and worry-free! Thank you for respecting our copyright. The original purchaser or designated agent (e.g. the sub) is licensed to reproduce and/or use the material but only within the original purchaser’s classroom or substitute assignment(s). This implies that only a single class set of a given EZSubPlans “day” will be printed in a given school year. Teachers who teach the same subject multiple times within a day, however, are authorized to print and use the material in each course. 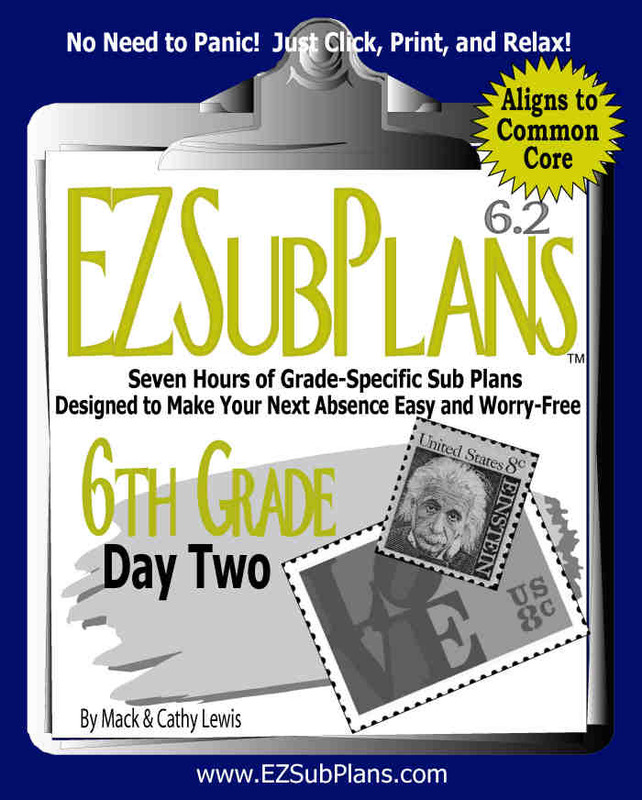 Substitute teachers purchasing EZSubPlans themselves are authorized to print and use the material in each grade-specific assignment. If you, the sub, provided EZSubPlans, please do not leave blank copies of the activities for the classroom teacher; leave only the “Today’s Activities” pages (pages 5 and 6). Thank you. Regarding material from the Public Domain, such as classic short stories: while the original story of such material may be free of copyright, our version, including the unique formatting, edits, and related comprehension activities, are fully protected by copyright. Again, we truly appreciate all of you who respect it. Textile artist Cathleen S. Lewis has been both a classroom teacher and a professional substitute since earning her teaching credential in 1994. Scholastic playwright and National Board Certified teacher Mack Lewis has been teaching full-time since 1993. For more on the goings-on inside his Oregon classroom, visit The Daily Platypus.